What are you doing April 13th or 14th? If your answer doesn’t include a fabulous afternoon and evening of fun, culinary delights from some of Coconut Grove’s finest restaurants, libations, and live musical entertainment, then open up your calendar and ink in The Great Taste of the Grove Food & Music Festival. It’s the perfect excuse to get out of the house and to eat, drink, rock and stroll! 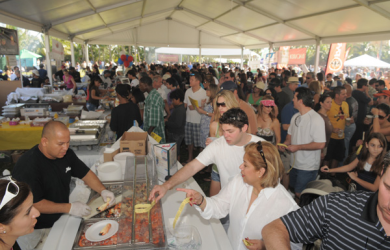 Festivities get started at 12:00 PM and go through 7:00 PM at Peacock Park, each minute offering you an exciting opportunity to enjoy samplings of mouth-watering examples of culinary creations from Miami's best restaurants for only $1-$8 a plate (food & drink not included in voucher). Picture yourself in this beautiful waterfront setting, having fun in a sophisticated fashion, tasting great food and sampling fabulous libations, while enjoying the company of all those around you and live entertainment all day long. This is a perfect treat for yourself, family and friends. Don't forget to bring the kids along so they can enjoy the fun zone with carnival rides and activities. Children under 36 months are free. Your voucher entitles you and your guests to VIP private line entrance so you can breeze on through and start enjoying all there is to offer at The Great Taste of the Grove. Choose from admission for two adults ($10) or family admission for two adults and two children ($15). May buy 1 per person.May buy 1 as a gift.Valid only for option purchased. Valid only for event on 4/13/13 or 4/14/13.